While stitching my mind wanders. Time to ruminate about every little thing. I'm at the age where I am caring for my mom and a son who has a mental illness. This added responsibility can add anywhere from 2 - 5 extra hours to a working day. How to handle the stress? I think each of us deals with that question daily. Sometimes I read a science fiction book....nothing like leaving this world for a bit of time. But the repetition of stitching offers a bit of peaceful time. Stitching can become almost Zen-like. It brings a calmness and quiet. 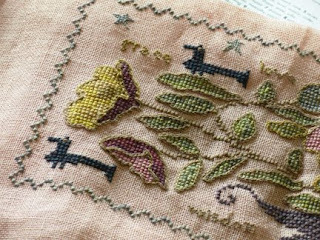 For me, it sometimes feels like I'm stitching a prayer into the linen. What do I pray for? I pray for grace, love, wisdom, patience, and kindness....all those things I want to be. When designing, I add these reminders into my samplers. Believe me....I'm no saint, I can sigh and roll my eyes with the best of them...but the next day I again get up and hope this day I can be kinder, more patient and loving to those who depend upon me. The sampler below is titled Garland Fair. It was a loose feather pattern. It was stitched during the time of hurricane Katrina. This pattern is sold out. This design is a preview of May's loose feather pattern. I've stitched all the things I pray for into this sampler. This pattern will be available soon. The pattern below is in the book With Needle and Thread. This book recently sold out. The title of the sampler below is Be Kind and True. 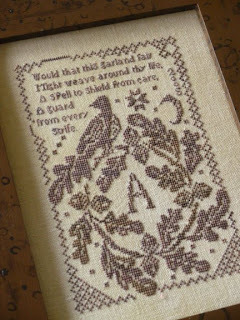 This saying has been stitched into samplers for years. This pattern is no longer in print. I hope you find peace through your storms of life by a bit of stitching. Be sure to stitch your prayers and thoughts into your samplers. There is always space in most designs to leave a bit of YOU. Thank you also for your kind comments. I have really enjoyed reading what you have to say. You're the best! My heart and prayers are in your stitches too. And in mine. My husband fights cancer, and I find great therapy in stitching ... on my machine. Right now that machine is in the shop and I feel just a little antsy. But handwork on samplers is what drove me to this all consuming hobby in the first place. Thank Heavens for all consuming hobbies. Alma, I think you're an amazing woman, and knowing you're caring for your mother and your son just makes that conviction stronger. I know for sure that your prayers and the beauty behind them come out in your wonderful designs. That new Loose Feathers looks absolutely gorgeous! And luckily, I have all the other designs you show too. Now to stitch them all! I am touched by your sharing so personally, I have cared for my grandmother and mother in law and have found rejuvenation in my sewing too. These memories are some of my most treasured, I may follow your lead and put a few prayers into my stitching. Your work is lovely. Caring for loved ones is such a trying thing! I think that it's amazing that you can do all you do and still give so much of yourself to your mother and son! Your new design is wonderful, as always and can't wait to get my hands on it. I especially love the chain-stitching vines and outlining! I think for so many of us, our thought, our hopes , and our prayers go into our stitching. If it is stitching a sampler, appliqueing a quilt block, or stitching the binding on a quilt. It is time, were our hands are not idle, but it is time that makes us contemplate life. Thanks for your inspiration in your designs. What a lovely sampler, and post for that matter. 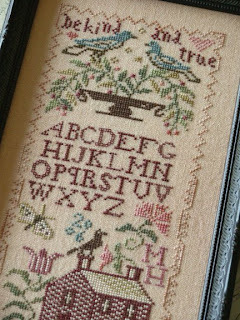 I love the idea of stitching those things I pray for into my samplers. You are always inspiring me! Thanks. BTW I read you are heading to Paris soon. I hope you have a wonderful time! The samplers is just fantastic... and they means a lot and thats why we love making them!! Take care and Happy Easter to yo and your family!! You are an example to all of us, providing such intensive care to your family and managing to be creative too. Stitching can be so therapeutic to the mind and soul. Thank you for giving us that glimpse at the new Loose Feathers (lovely colours! ), I'm really looking forward to it. stitching is my cure against stress and bad thoughts as well. 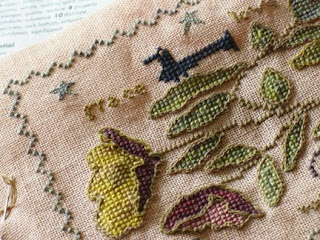 I've also to confess that your designs have something special and it's always a pleasure when i stitch them: lovely on both sides, colors and design itself. thanks a lot for sharing your talent. Have a peaceful Easter with your family! (((((Alma))))) I found out that you had a blog last night, and bounced out of bed this morning to do some proper drooling. So... I am thrilled that you have a blog. Now you have me thinking about what you posted. Thanks for sharing. I need my stitching, every day, to calm myself. Prayers and wishes and thoughts (and dog and human hair!) are woven into my samplers as I think of my family and my extended family and what I can control & what I can't control. I can control the stitches in my fabric and it gets me through what I can't fix and change and control. When it gets really bad, I stitch while listening to EWTN on the satellite; I pray and stitch and it gets me through. Alma - this post is wonderful. Thanks for sharing. Just warms my heart and needle. Your new design is delicious!! Have a safe trip to Paris. Hugs and Happy Stitching! I just found out you have a blog and this is only the second day I have read it...I went the whole way back to the beginning to look at your beautiful pictures. I have done at least 20-25 Blackbird Designs cross-stitch pictures and have all your quilt books also. I love what I can see of the May Loose Feathers. I don't know what I would do without my family, immediate and extended, but sometimes they do put such a stress in your life. Stitching helps me deal with that stress. thanks for your lovely blog! I am so glad you have a blog. Your designs have given me so many hours of joy. Nothing is more comforting than stitching. Can't wait for the next Loose Feathers. I pray God's strength for you. Doing hand work for me is calming too. It is a great time to sitch and pray at the same time. What a beautiful post! You and your work are both inspiring. Thank you for sharing! Stitching takes one of the most important part of my day, even I cannot do it evey day.I confess that if I don't stitch it seems that I missed something, the reason is that when I'm doing it I just get out of problems of life big or small is not really a matter.Stitching takes me away and helps me thinking on doing my best. Lot of my works are results of little tempests of my life. Thank you for sharing your sweet thoughts and Happy Easter to all of you. Love the sneak peak! I just went and signed up with Drema for the Loose Feathers again this year. Also, got the stockings coming to me. 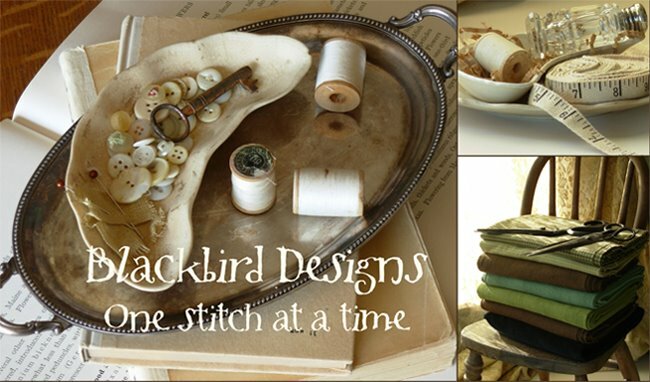 I would love to have my whole house decorated in Blackbird Designs! You girls ROCK! I am thrilled you Blackbird girls are now blogging; I love all your stuff. My project for the weekend is to start the pillow sham from When the Cold Wind Blows. Thank you for the inspiration to pray while stitching. In these days, both are a comfort. Blessings to you! thank you so much for this post Alma, what a blessing our stitching is. Thank you for sharing this bit of your soul. So many of us women share so many of life's experiences, don't we? The needlework soothes me, too. I think this is a great post too. Love what you say at the end , and how we can " touch " our samplers with our prayers and thoughts. I just do a post about this new adventure for your Spanish lovers in my blog. I hope they enjoy as I have done . Now we can enjoy this little corner from you . Good luck " new bloggers "! 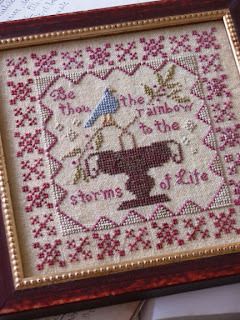 Dear Alma, I have stitched your designs for many years...I am delighted with your blog...thanks for sharing so openly...life is hard, but a happy heart is everything...and stitching is just like that a prayer in linen...you have a beautiful heart! Oh, Alma - I'm so happy to find a fellow stitcher (although I consider you much more than a stitcher) who also enjoys science fiction. I recently finished "Without Warming" and really enjoyed it. The bad thing is that it's the first in a trilogy and the second book won't be out until 2010. I took notes on the characters but I'm planning on re-reading WW before I start the second book. Now - back to my stitching.